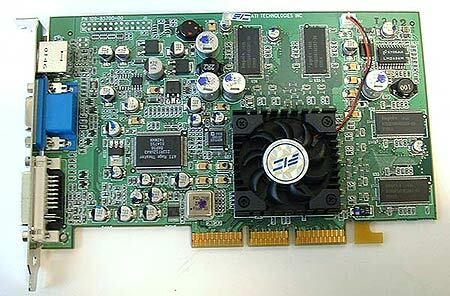 Abstract: The FIC Radeon 8500/AT0008 is one of the first in the series of FIC videocards to hit the market. Like other manufacturers, FIC knows that to gain market share they have to diversify their lineup, and the best step in the right direction has always been to produce videocards. The FIC Radeon 8500/AT0008 is one of the first in the series of FIC videocards to hit the market. Along with the powerful Radeon 8500 GPU, the AT0008 offers itself up to consumers for about $250CDN. The card we received for testing is essentially the same physical card that ATi offers, but with a few PCB revisional changes and healthy handful of shiny little FIC stickers all over it. What is included in the package for $250 CDN? Well along with the video card, there is a DVI to analog converter, an S-Video cable, user manual and a driver CD. One thing to remember, the FIC version, while not exactly identical to the ATI version in terms of core/memory timings, is about $150 CDN lower then the Retail ATI Radeon 8500 so it can be quite a good deal. The FIC Radeon 8500 sports a 15-pin analog monitor output and one DVI connection along with a S-Video out jack. Even though FIC is a large manufacturer of motherboards, their Radeon 8500 is still considered OEM since it's not sold directly by ATI. As many of you may realize, ATI clock all OEM versions lower then their Retail versions. Thus the ATI Radeon 8500 has a core set to 250MHz down from 275MHz, and a 500 MHz bus speed down from 550MHz. ATI seems to feel that this justifies the higher price tags for their retail cards. Another thing to keep in mind is that even though both the Retail ATI Radeon 8500 and the OEM Radeon 8500 versions (like the good old FIC card above) have the same actual hardware, most users will never be able to overclock to, or much higher than retail speeds because the BIOS versions are different. As I understand it, the OEM BIOS feeds both the R200 core and the memory with slightly lower voltages then are found with the Retail Radeon 8500. Below is a chart on how the older Retail ATi Radeon 64MB VIVO compares to its newer brotheren. Knowing about the differences between the OEM and Retail BIOS's, I wasn't getting too excited about the chances overclocking the FIC Radeon 8500 really high.